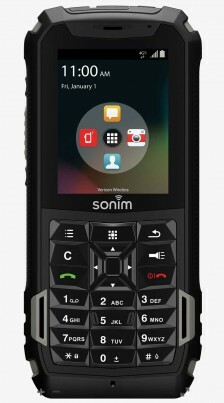 The Sonim XP3 is a new rugged clamshell-style phone for Sprint. The two companies announced the phone today, and it's available now. The phone is rugged to military specs, and waterproof with an IP68 rating. Its large buttons are designed to be glove-friendly. It supports Sprint's Direct Connect Plus PTT (walkie-talkie) service. Its 100 dB speaker with noise cancellation is designed to be extra-loud and clear. The software is based on open-source Android (Oreo) but cannot run Android apps. It has a removable 1,500 mAh battery, 2.6-inch LCD main display, small outer display, and a memory card slot. It comes with a three-year warranty. Sprint is offering it for $240, or $10/month. Google’s Android Enterprise Recommended program now includes a number of rugged devices. The program, launched earlier this year, requires phones to meet a number of qualifications, such as updates to the core OS and security patches. In order to qualify for the rugged recommendations, devices must meet basic specs for surviving abuse, water submersion, and more. The initial list of devices making the grade includes the Zebra TC25, TC51, TC56, TC70x and TC75x; Honeywell Dolphin CT40, Dolphin CT60 and Dolphin CN80; Sonim XP8; Point Mobile PM45; and the Datalogic Memor 10. Google already recommends a significant number of regular Android devices from BlackBerry, Sony, and others. AT&T today said fire, medical, police, and other first responders now have more access to its FirstNet network. FirstNet has been available for purchase by agencies, but hasn't been directly sold in stores. Beginning today, any verified first responder can walk into one of AT&T's 5,300 retail shops and initiate service with a new device. The retail availability of FirstNet will be a boon to first responders who volunteer and/or aren't issued communications devices by their agency or local government. A fairly wide number of phones are compatible with FirstNet, including the Samsung Galaxy S8, S8 Plus, S8 Active, Note 8, S9, S9 Plus, and J3; Apple iPhone 6/Plus, 6s/Plus, 7/Plus, 8/Plus, and X; LG V35 ThinQ; Motorola Moto G6 Play; Sonim XP5S and XP8; BlackBerry KEYone; and the Nighthawk LTE Mobile Hotspot Router. The public safety network is available nationwide in its own, reserved spectrum (Band 14). First responders may also sign up for FirstNet service using AT&T's web site. 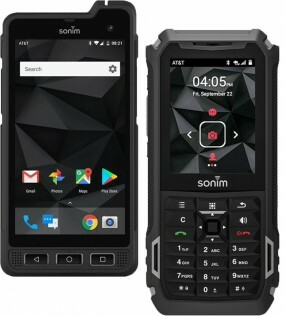 Verizon Wireless today added the Sonim XP5 to its roster of rugged handsets. The XP5 is a bar-style feature phone that includes push-to-talk service (with a dedicated PTT button) for the working set. It meets mil-spec ratings for protection against physical abuse and carries an IP69 rating for protection against water, including jet sprays. 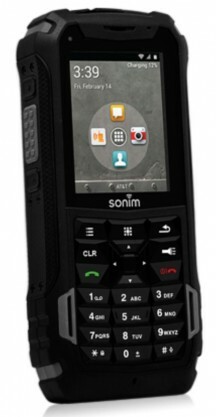 Sonim says the phone can sit in 6.5 feet of water for up to 30 minutes. The phone has a 2.5-inch QVGA screen with a proprietary operating system. Other features include a 5-megapixel camera, extra-loud 104dB front speakers, a 1.2 GHz Qualcomm processor with 1 GB of RAM and 4 GB of storage, and support for HD Voice. The Sonim XP5 is available from Verizon Wireless for $336, or $14 per month on a payment plan. AT&T today announced plans to soon sell the Sonim XP5. The XP5 is a fully ruggedized feature phone that carries an IP68 rating for protection against liquid and dust ingress, and a mil-spec 810G rating for protection against drops and other physical abuses. The Sonim XP5 has WiFi and LTE 4G, and is compatible with AT&T's enhanced PTT service. 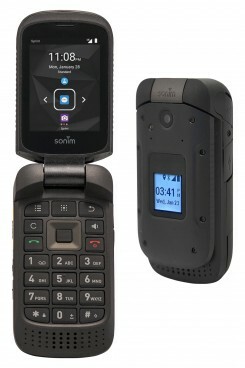 The device has a 3,180mAh battery, which is unusually large for a feature phone, and a speakerphone that creates 104dB of output for overcoming noisy work environments. AT&T claims the screen can easily be read outdoors under sunny skies. AT&T said more details, including price and availability, will be disclosed at a later date. AT&T today announced a slew of improvements to its enhanced PTT service. Most notably, AT&T has released an API that will let developers add PTT communications directly to their business's dispatch operations. Other new features included in EPTT are: Talk Group Scanning, so managers can prioritize group chats; Broadcast Calling, so businesses can make announcements to 500 people at once; Sonim Channel Select, which lets owners of the Sonim XP6 and XP7 easily change talk groups; and FIPS certification for secured government use. AT&T's EPTT suite is available to businesses and is compatible with most Android handsets. 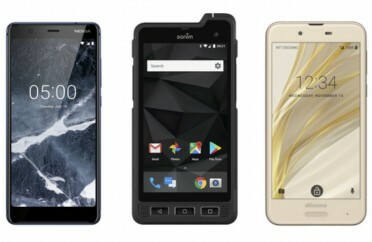 Sonim is hitting its stride in its quest to make the best rugged phones for demanding industries. 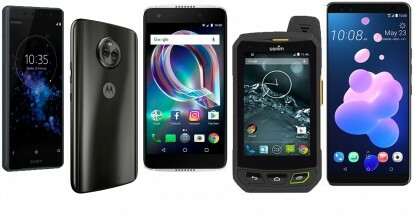 The XP6 and XP7 are the company's best efforts to date, and represent much more than just two phones, with support for a whole ecosystem of software and specialized accessories. We check them out in our hands-on. AT&T today announced the immediate availability of the Sonim XP6. 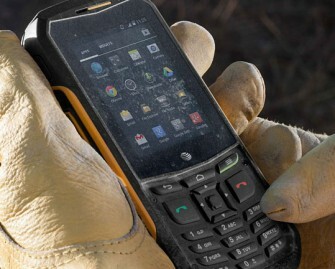 The XP6 is a highly rugged Android smartphone that includes buttons and controls like a feature phone. It is certified to mil-spec 810G for protection against drops, vibration, temperature extremes, and humidity. The IP68 rating means it is protected again water and dust intrusion, as well. The XP6 is compatible with AT&T's enhanced PTT service, and has an extremely loud speaker at 103dB. The phone has a 2.64-inch display with 320 x 424 pixels. It runs Android 4.4 KitKat. Specs include a 1.2GHz quad-core Snapdragon 400 processor with 1GB of RAM and 8GB of internal storage; 5-megapixel camera with 720p HD video capture; an extra large 4,820mAh battery; and Bluetooth, GPS, LTE, and WiFi radios. AT&T is selling the Sonim XP6 through its business sales channels. The Sonim XP6 is available for $0 down at $17.50 per month on AT&T Next 24; $21.88 on AT&T Next 18; $26.25 on AT&T Next 12; $149.99 with a standard two-year contract; or $524.99 with no commitment. Business and government customers can buy the XP6 for $100 with a two-year contract as long as they also sign up for EPTT service. 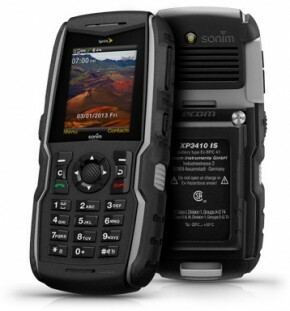 Sprint has started selling an intrinsically safe (IS) version of it Sonim XP Strike rugged Direct Connect phone. IS devices are designed for environments with flammable gasses or dust. Such devices have extra protections to ensure that - even in the event of a component failure - the device cannot be a source of ignition. IS devices are required in places that handle large amounts of fuel, mines, and even some large bakeries. The last IS phone offered by Sprint was the Motorola i365IS, an iDEN phone introduced in 2008 and discontinued in June 2012. The Sonim XP Strike IS has a special IS battery that protrudes from the back, making the phone 1.2" thick. The battery and other IS changes also bump the price up to $600 on contract. The XP Strike IS is available now. AT&T today announced the Samsung Rugby III and the Sonim XP5560 Bolt are the first two devices to ship with its Enhanced Push-To-Talk service on board. Rugby III: This ruggedized flip phone is built to mil-spec 810G for protection from water and dust ingress, as well as from shock. It includes a 2.4-inch QVGA display and a 3 megapixel camera. It is free with a new two-year PTT contract. Bolt: The Bolt is an ultra-rugged phone built to endure the toughest environments. It is a bar-style device that can withstand six-foot drops to concrete and submersion in water for up to 30 minutes. It is being sold for $199 with new PTT contracts. AT&T's new Enhanced PTT plans cost $5 per month when added to existing AT&T voice and data plans or $30 per month for a PTT-only rate plan (no voice or non-PTT data included). Availability of the devices was not provided. AT&T today announced the availability of its Enhanced Push-To-Talk service, an update that adds a wide range of new features to its PTT offering. According to AT&T, Enhanced PTT works on 3G and LTE 4G networks and boasts faster call set-up times, presence indicators, and the ability to run on a wide range of smartphones and feature phones. The improved service also adds a bevy of business-friendly tools, such as integration with enterprise applications, supervisor override capabilities for important communiques, and support for large contact databases and large groups (1000 and 250, respectively). The service is launching on the Samsung Rugby III and the Sonim XP5560 BOLT. It is also being made available as an application to devices such as the Samsung Galaxy Rugby Pro, the RIM BlackBerry Curve 9360 and Bold 9900. 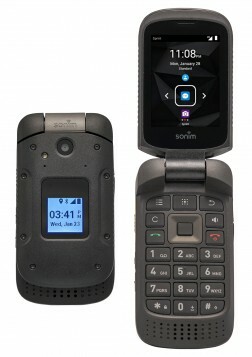 Several rural carriers will be making the rugged Sonim XP3 phone available in the U.S. in early 2009. 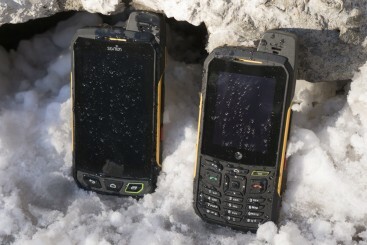 The XP3 is fully ruggedized to withstand abuse. It can stand 6-ft falls onto concrete, it is waterproof and it is resistant to dust and other particles. It has 2.5 days of talktime and 2 months of standby time. It will have quad-band GSM/EDGE radios, GPS, and Bluetooth. It has a 3 megapixel camera, but no video recording and no media player. Pricing details were not provided, nor were the identities of the U.S. carriers to offer the XP3 made known.